Zhu Ye Qing Green Tea is from the famous Mount E Mei in Sichuan, China. Mount E Mei is one of the Four Sacred Buddhist Mountains of China. Beautiful sceneries with pristine ecosystem 800-2,000 meters above sea level. Zhu Ye Qing Green Tea is grown in an organic and fertile soil of this region. 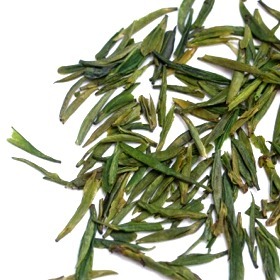 From 1980s Zhu Ye Qing Green Tea became one of best teas in China for its unique quality. Since then it became more visible among tea drinkers around the world. A very refreshing and relaxing tea. Definately hit you on your first sip. This tea is not to be missed. Refreshing sweet floral with sweet lingering aftertaste. Greenish flat and straight tea leaves. excellent green tea, with a very fresh taste, and very beautiful tea leaves. Another fine tea! Teacuppa hasnt let me down yet. First, this tea leaf is beautiful. Almost looks like small pine needles and has a nice vibrant green to it. Steeps quite light and is quite refreshing. Mild but enough subtle and interesting flavors to make this a favorite. Enjoy! The tea looks very good,small uniform buds and leaves.I have tried brewing this tea 3 times being very careful with both water temperature and brew time and it always comes out very bitter and completely devoid of any floral scent or good taste.